Who was more noble than who? Here’s another article on the church at Thessalonica. Quick, who was said to have been more noble that who? Don’t know? Okay, let me jog your memory. I’m talking about the people in Acts who were said to be more noble that some other folks “because they received the word with all eagerness, examining the Scriptures daily to see if these things were so” (ESV). Now do you know who was more noble than who? 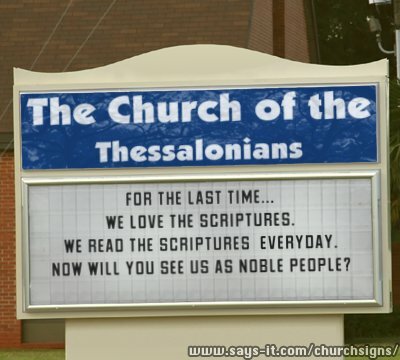 Did you say, the Bereans were more noble (or fair-minded for you NKJV folks) than the Thessalonians. Well, if that’s your answer then you are… WRONG. (10) “And the brethren immediately sent Paul and Silas away by night to Berea: who coming thither went into the synagogue of the Jews. (11) These were more noble than those in Thessalonica, in that they received the word with all readiness of mind, and searched the scriptures daily, whether those things were so. Luke is not comparing the church in Berea to the church in Thessalonica, rather he is contrasting the way the the Jews in Berea eagerly listened to Paul’s message and searched the scriptures to see if what he said was so (ref. Acts 17:2-3) compared to the way Jews in Thessalonica received Paul’s teachings on the Christ, or better yet, did not receive his teaching. Instead of seeing if what Paul said was so the Jews of Thessalonica, out of jealousy, persecuted the believers, namely Jason (ref. Acts 17:5-9; 2 Thessalonians 1:3-4). “We give thanks to God for all of you, constantly mentioning you in our prayers, remembering before our God and Father your work of faith and labor of love and steadfastness of hope in our Lord Jesus Christ” (1 Thessalonians 1:2-3 ESV). “For not only has the word of the Lord sounded forth from you in Macedonia and Achaia, but your faith in God has gone forth everywhere, so that we need not say anything. For they themselves report concerning us the kind of reception we had among you, and how you turned to God from idols to serve the living and true God” (1 Thessalonians 1:8-9 ESV). “We ought always to give thanks to God for you, brothers and sisters, as is right, because your faith is growing abundantly, and the love of every one of you for one another is increasing. Therefore, we ourselves boast about you in the churches of God for your steadfastness and faith in all your persecutions and in the afflictions that you are enduring” (2 Thessalonians 1:3-4 ESV). Even though they were being persecuted and afflicted (ref. Acts 17:5-9), the faith, love and steadfastness of the Thessalonians continued to grow abundantly. So great was Paul’s love for them, he would boast to other churches about the Thessalonian’s faithfulness to the Lord. That does not sound like the Thessalonica that I’ve always pictured based off our misunderstanding of Acts 17:10-11, I’m sure it does not fit your’s as well. The Thessalonian believers were indeed a noble group of men and women who loved God, His word, and His people. (1) The church at Thessalonica is a church to be emulated in every way. They were a faithful band of believers who continued to grow in faith, love, hope and steadfastness, even in the face of persecution and afflictions. This is the kind of congregation that we should all strive to form and be a part of. (2) We need to search the scriptures daily to see if the things we believe are so. For the longest time I thought this passage was comparing the church in Berea to the church in Thessalonica. I have learned, and I hope that you have too, that we need to search the scriptures daily to check and double check to make sure our beliefs align with what the scriptures teach. Remember, keep searching the scriptures daily and keep the faith. P.S. 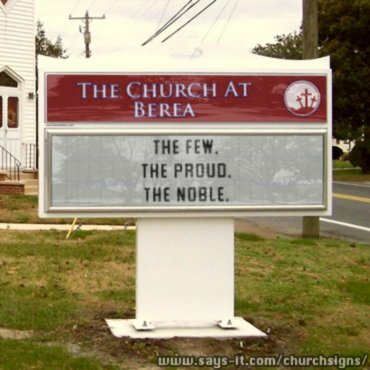 There are a lot of congregations that use the name Berea (I guess because of Acts 17:10-11) but I don’t know of any that use Thessalonica. Do you know of any congregations that uses the name Thessalonica? If so drop me a line at clay@claygentry.com, I would love to hear from you. Great thoughts, Clay. Until you shared this with me, I had never thought about it like this. I’m sure this will make its way into a Give Attention to Reading post when I get back to Acts again. One thing I can’t help but think is how often Christians have used this passage as a stick to club other folks with for not reading their Bible enough to agree with us about everything. Then we dismiss anyone who hasn’t already come to the conclusions we have because they must not read their Bibles enough. What made the Jews in Berea more noble was when they heard something that didn’t mesh with what they had always believed, they didn’t simply dismiss Paul. Rather, they got out the scriptures and searched. Perhaps we should be more like that when someone says something different than the norm. I’m not saying we just accept whatever anyone has to say. I’m just saying the noble-minded approach is to spend time in the Word, not just dismissing something out of hand.